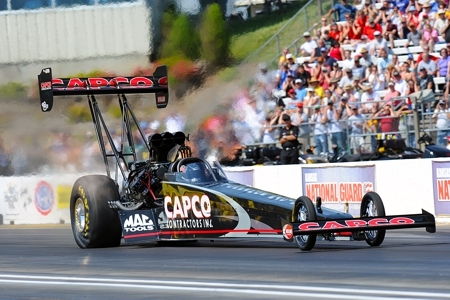 May 20, 2012 -- Steve Torrence’s string of good performances came to a flaming halt on Sunday in the second round of the Summernationals at Heartland Park Topeka. An engine explosion triggered a fire and Torrence took a brief, wild ride sideways before he could get it stopped. David Grubnic drove to the easy win. Crew chief Richard Hogan said a broken connecting rod was the part likely responsible for the malfunction. Torrence did begin the day with a win over Hillary Will, 3.776 seconds at 326.79 mph to 3.932 at 298.27. “All in all, it was still a pretty good weekend,” he said. “The car ran well in the first round – it was third-quickest – and we continued to qualify well. We will be ready for the next race at English Town (N.J., June 1-3).